Here lies Anges Gellis, laid to rest at the age of 92 surrounded by family and friends; it was a sad occasion colored with great stories of this feisty matriarch. We drove out to Danielsville PA for the service, after which the reception hall filled with great stories and laughter. 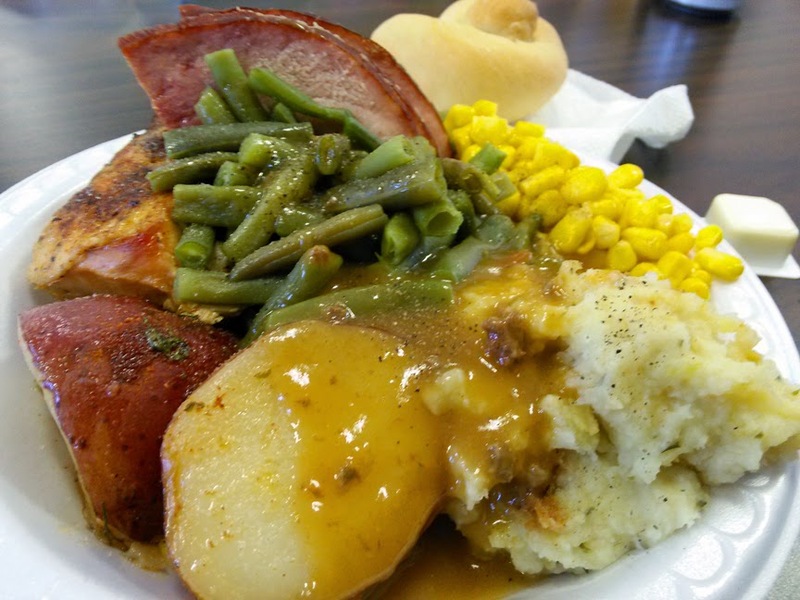 The banquet table overflowed with chafing dishes of baked ham, roast chicken and potatoes, stuffing, corn, green beans, salad with bacon dressing and buttered rolls along side a separate island of kiffel, cheese cake, rice pudding and other sweets. Agnes had a pet rooster named Pete; she played guitar and loved to polka; Pennsylvania Dutch was her first language; she always had a choke to make you laugh. Her daughters and grandchildren eulogized how she was a frugal disciplinarian yet she was generous to all, especially with her baked goods. This loving granny was the queen of the rhubarb pie. I often ponder the association of death and food. People on Guam are renown for epic funerals with devout prayer vigils that run the course of seven days. 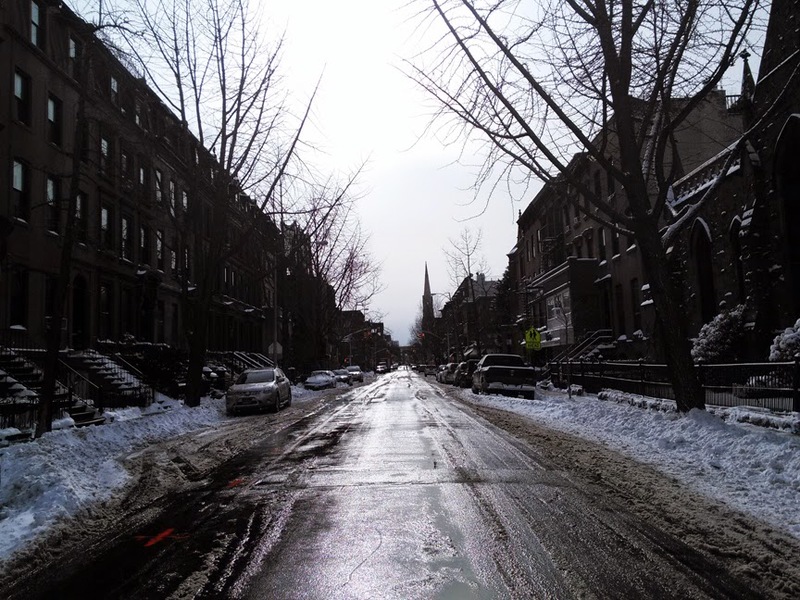 But despite the tone of sadness, funerals also bring about celebration and a tribute to a person’s life— or as my parents would say funerals are reunions of a certain age. As with all sad occasions on the island, grieving comes with a generous banquet. And with that banquet comes the balutan, the to-go plate that you pack on your way out. Balutan is co-opted in Chamorro from the Filipino word which means “package.” But on Guam it’s used more as a verb that pertains to taking food with you. “Fan'balutan hu na talo'ani pot agupa.” “Pack my balutan for dinner tomorrow.” you can hear people yell from the parking lot to the person carrying the roll of tin foil. On Guam balutan is a well honed skill and everyone has their own technique of assemblage. In general you build a base with a paper plate and place the more solid foods first (ribs, BBQ, chicken, Spam, sausage) followed by a halo of softer foods (red rice, kelaguen, kimchee, corn, pasta) finish with savory pastries (tortillas, potu, lumpia, empanadas) then finally sealed in foil with an air-tight crimp. The goal is pack it in such a way that you can eat your way from top to bottom, so the order of food is most important. Sweets and delicate pastries are packed separately. Island folks build massive foil towers but you can spot the real pros, they bring their own plastic containers. At my fathers funeral his friends told me how much they missed him and how much I look like him when he was younger— many asked who did the catering and who made the flan. These are hardly insincere questions, the complement on the fresh soft rolls and BBQ note the host’s attention to detail. It is more of an insult if no one takes food home with them. My aunt who lead the rosary vigils brought her legendary Tupperware set that stacked and fit perfectly into the cooler in her pickup truck. Portable Infant of Prague with carrying case, vigil candles, gold rosary beads and Tupperware— Auntie Fe is balutan-ready and always prepared. 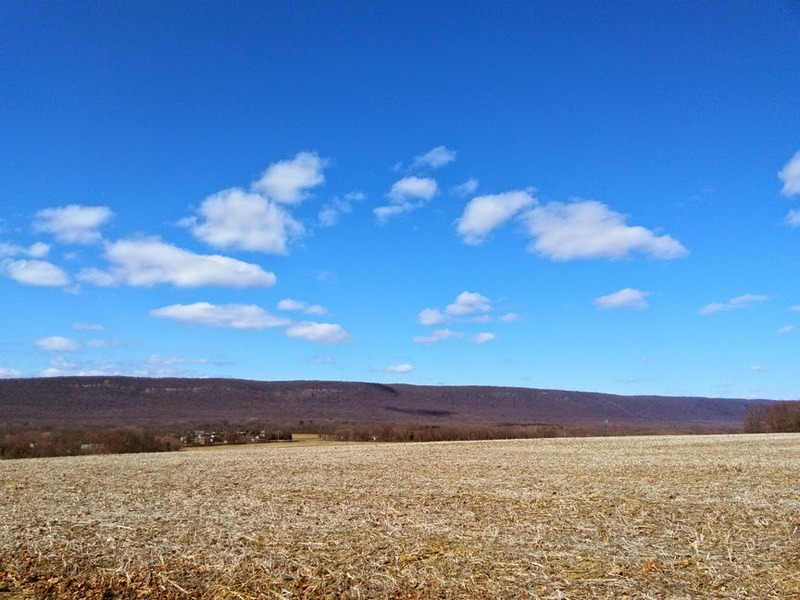 As I stood in a freshly plowed field in Danielsville, PA, I reflected on all the changes that this woman had lived through. Rural roads that wound through farmland became suburban track homes and highways over time. Seeing her children have children. Truth be said, I’ve only met Agnes Gellis once before, but I got the sense of her being. She will be remembered and missed by all. Life and death are celebrations and we must must all take part in this sweet and savory feast. 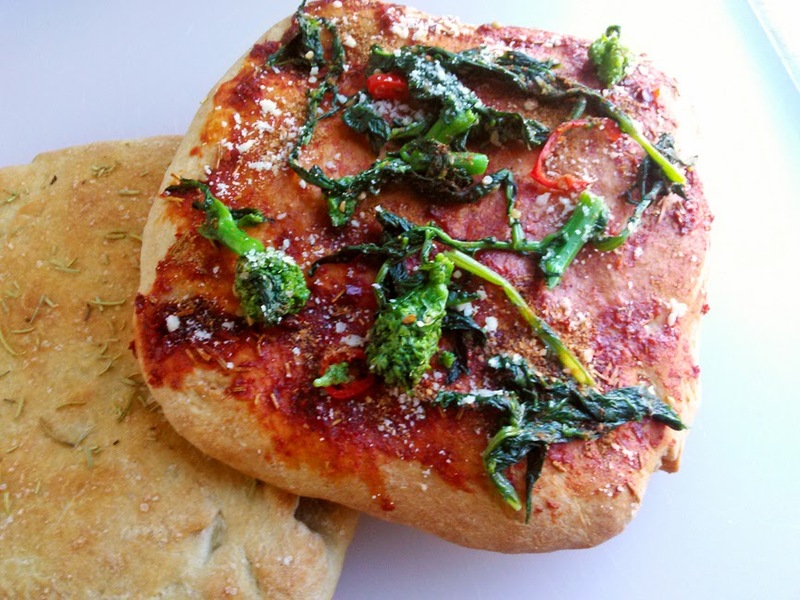 Italian focaccia bread with Korean chili paste with rapini namul, East and West have come together in the oven. Doh! I was trying to make Italian bread this past weekend but my dough didn’t rise as high as I wanted. But all was not a waste, I made focaccia instead with gochuchang, Korean chili paste. Baked pastries and breads are not traditional Asian methods of cooking, but their Western influences have been widely adapted and transformed. Koreans and Japanese tea shops are bustling with French pastries and cakes; China is now the largest consumer of red wines and Scotch whiskey. It’s only fair since Italian pasta originated from the Far East. I recall Chinese pizza from trips to Hong Kong and Philippines: spongy rice-wheat crust with sweet red sauce topped with hard-cured lapsang sausage. It wasn’t terrible, but it sure wasn’t pizza. 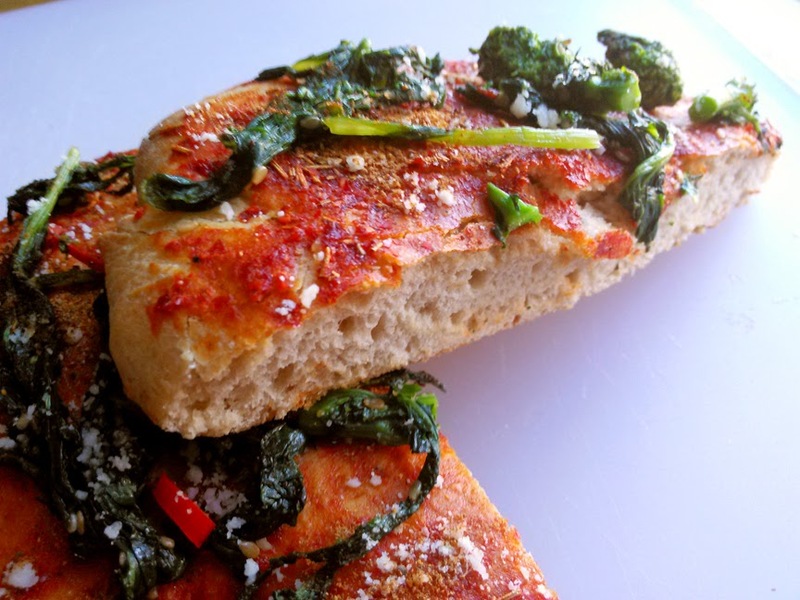 Focaccia is an oven-baked flat bread similar to pizza but instead of tomato sauce and cheese it’s lightly flavored with herbs, course salt and olive oil. I’m experimenting with combinations of bread and rice flours, as well as extra virgin olive and dark roasted sesame oils. 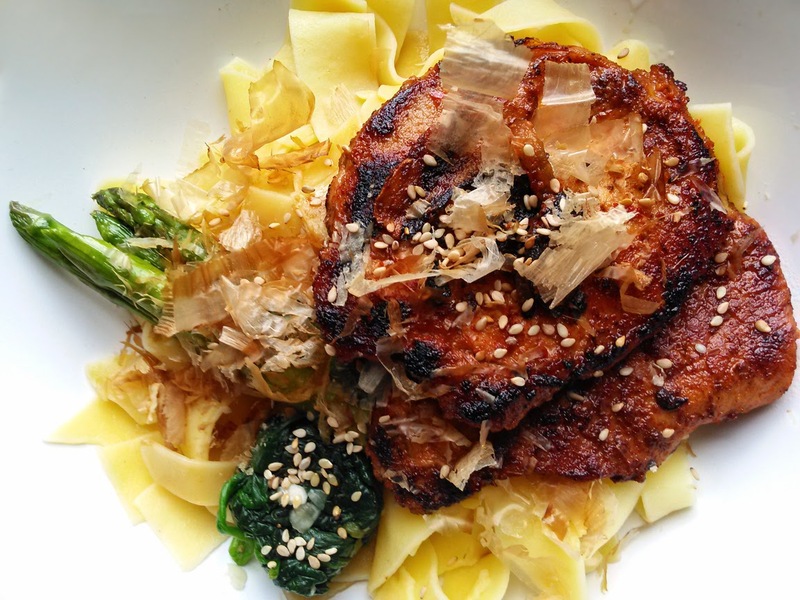 Instagram friend and sous chef Jason LaVerdiere aptly named this dish gochujaccia, and thus the name has stuck. This recipe is still in development. I’m sharpening up my baking skills for the pastry section of my ePUB cookbook. Of course I’m also working on the gluten-free version of this toothsome Italian bread. Here’s a sneak peek. 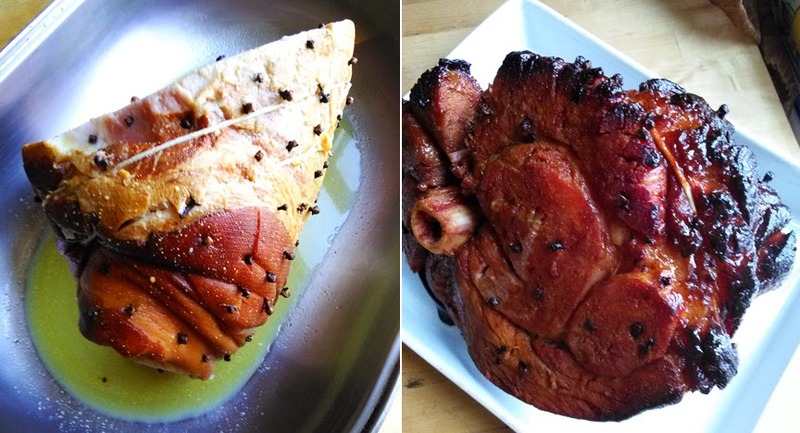 After hours of prep and basting the long awaited Easter ham popped out of the oven by late afternoon in all its cloved glory. 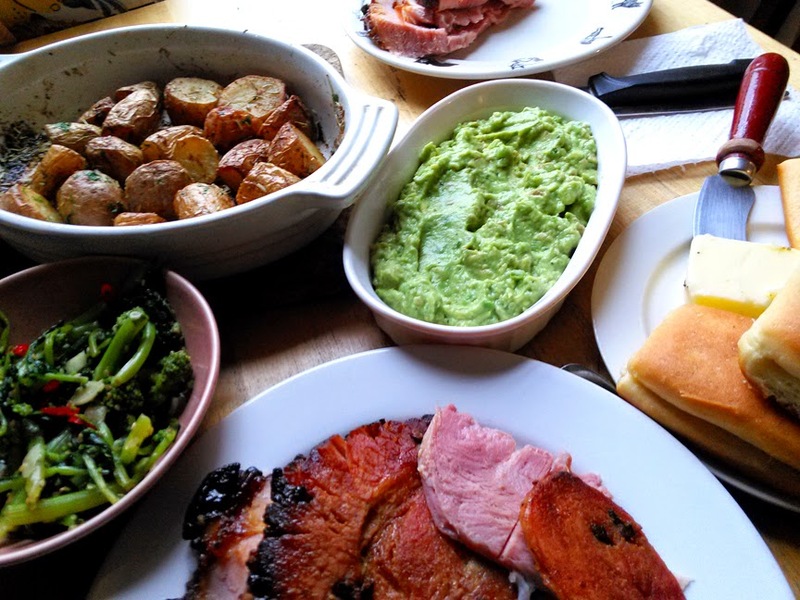 The orange-maple glaze and low-slow cooking made the ham moist and succulent; it was simply delicious as were the roasted new potatoes with rosemary and cotija cheese, braised rapini and greens, guacamole (yes guacamole) and cranberry bread. I was most proud of my freshly baked Parker House rolls— layer upon layer of soft buttery pillows finished with a light dust of sea salt. They melted in our mouths. 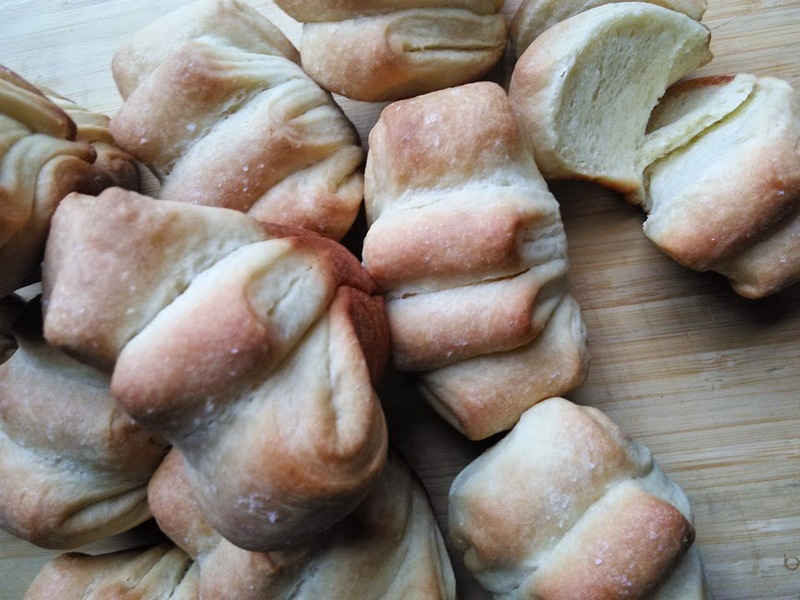 Parker House rolls (eponymous of the famous Boston hotel) are yeast rolls made with milk, sugar and lots of butter, known for their light, velvet texture and mild sweet flavor. Although they are a New England trademark pastry they became a fiesta staple on Guam; we just call them sweet rolls. I’m not much of a baker but I finally got the hang of this Fanny Farmer recipe by my third batch. You might say I was on a roll. 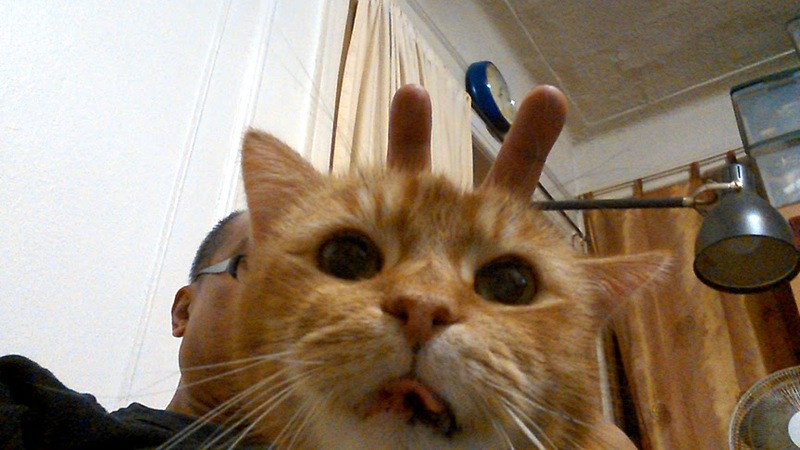 Here’s a peek at Easter dinner. 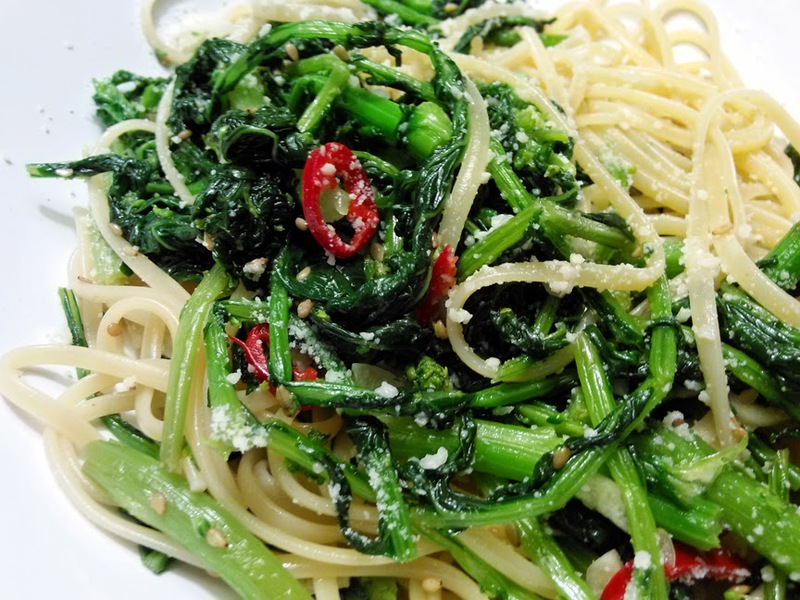 Korean inspired Broccoli rabe with tossed with fetuccine pasta — this rapini side dish goes a long, long way. Last night I made a batch of rapini namul to use as pizza topping. Pizza has become an important part of our Sunday viewing of “The Walking Dead” with our friend Jenn in Bay Ridge, Brooklyn. 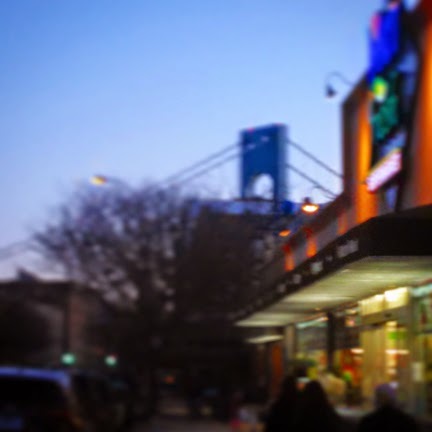 Luckily for us Bay Ridge is never short on great pizza. Rapini (broccoli rabe) is an Italian cruciferous vegetable from the same family as as broccoli, kale and mustard; it’s grown for its tight green florets and tender leaves. It has a nutty, peppery flavor with a slightly bitter aftertaste. It’s a very healthy green rich in vitamins A, C and K, and minerals potassium, calcium and iron. I love the way it tastes when it’s cooked and seasoned properly. My friend Elaine’s mother, Lena Cardella, showed me the proper Southern Italian way to prepare rapini, which I’ll gladly share. Namul is a Korean style of preparing highly seasoned vegetables— first steamed or stir-fried then tossed with a combination of seasoning which include roasted sesame seed oil, soy sauce or salt, vinegar, fresh garlic, sliced scallion greens, Korean chilies and toasted sesame seeds. It’s usually served as along with small side dishes that accompany the main meal— in our case New York style thin crust pizza. 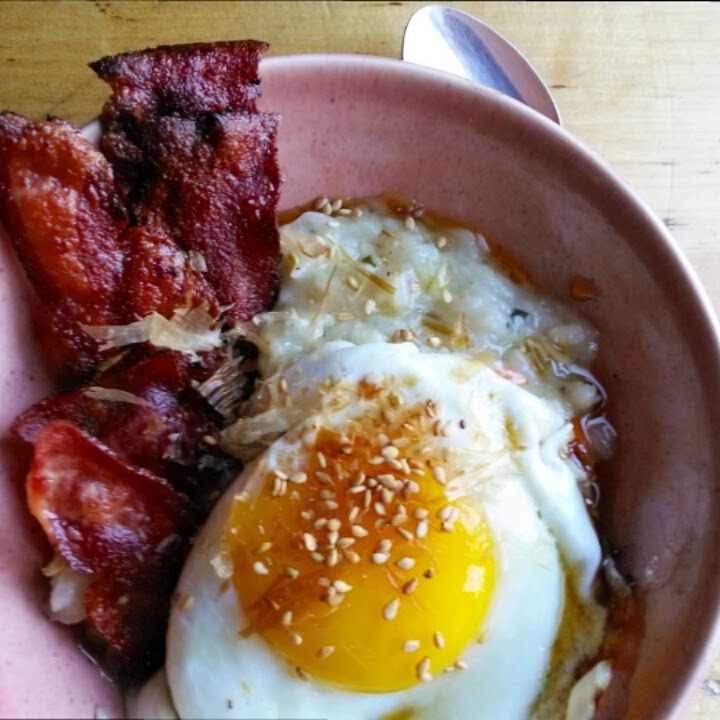 Here’s a recipe for making one of my favorite Korean-Italian fusion foods. 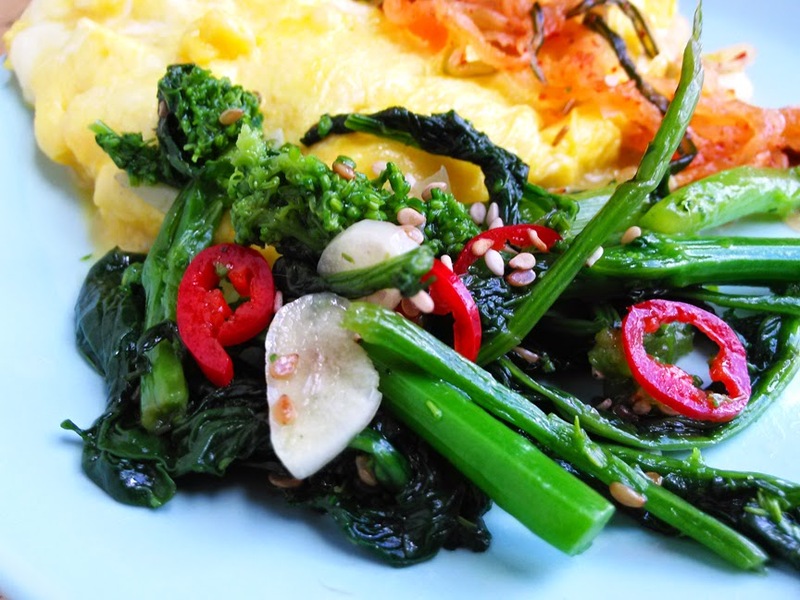 A Korean-Italian side dish from Brooklyn served with a French omelet— how's that for world class dining? Prepare the rapini: cut the blossom ends three inches down into the stem; remove and reserve the leaves from the stalk; cut the stem into pieces that are 2 to 3 inches long. This next preparation is important: with a small knife or vegetable peeler, peel the woodiest part of the stems. This will remove most of the bitterness and bring out the natural sweetness when it cooks. Wash everything well and and drain fro 20 minutes in a colander or run through a salad spinner. Thinly slice two cloves of the garlic and divide into equal portions; crush the third clove. To flavor the olive oil, heat skillet on medium and add olive oil and the crushed clove. When the garlic clove turns a golden color, remove from the pan and discard. Toss rapini and half the amount of sliced garlic with salt, place in the pan and cover. Steam for three to four minutes or until the volume is reduced by a third. Remove cover and stir-fry until blossom ends are firm yet fork-soft. Transfer contents to a metal bowl to cool or set into and ice bath. 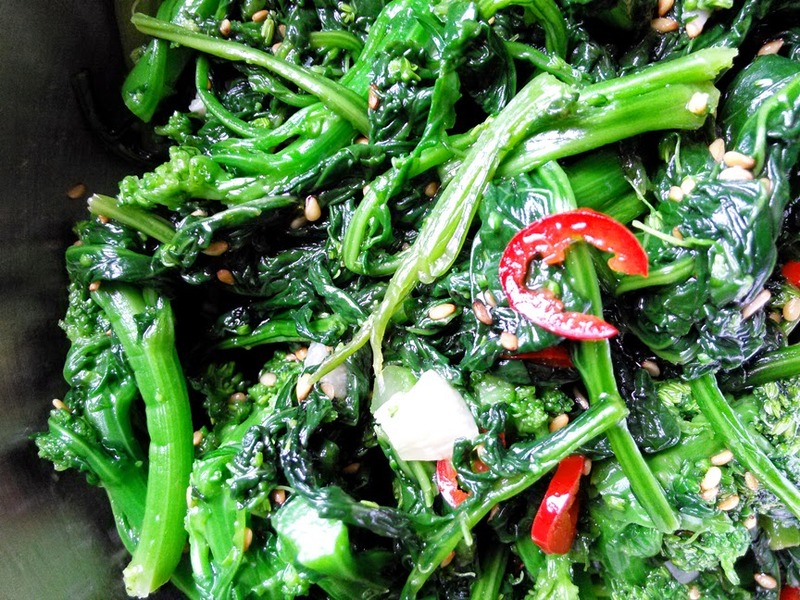 When rapini has cooled toss with sesame seed oil, rice wine vinegar, the remaining portion of sliced garlic, toasted sesame seeds and sliced Korean chili; adjust the flavor to taste. If you prefer a little sweetness, add sugar (if you’re vegan) or honey and toss. 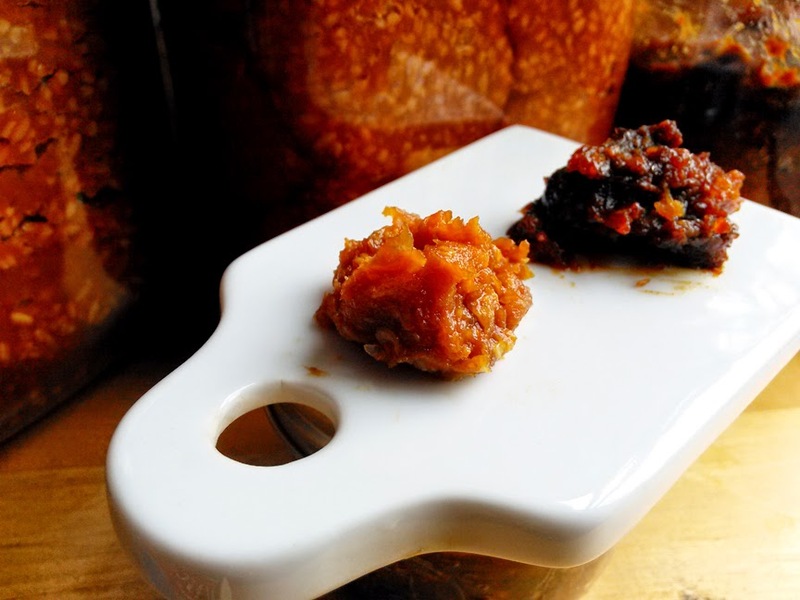 Place in an airtight container and refrigerate for at least an hour before serving. Rapini namul will keep refrigerated for about five days. 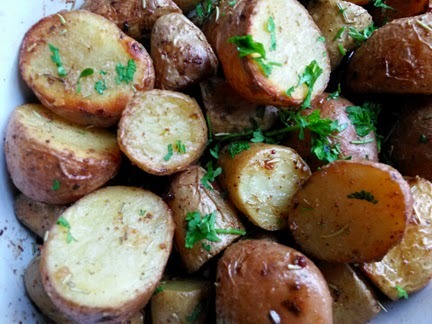 Enjoy it as a side dish or a topping for rice and pasta (or pizza). 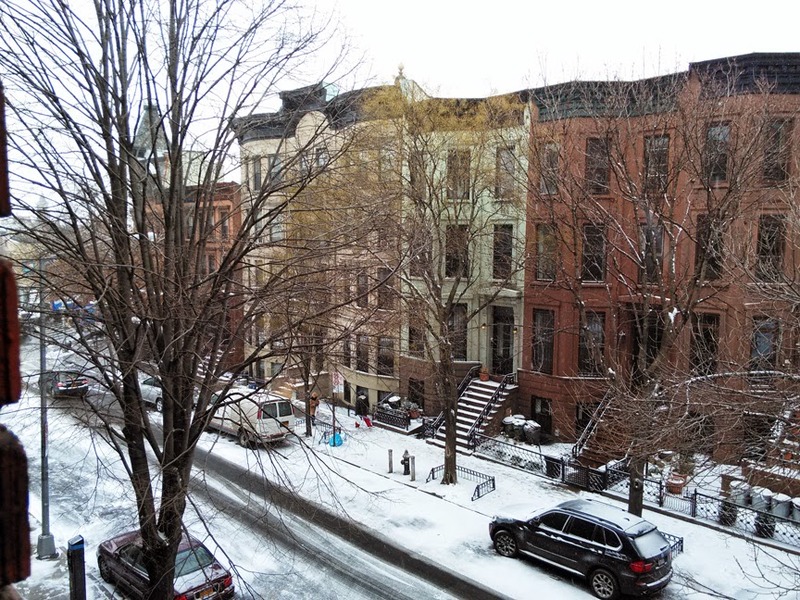 After days of icy gale force winds, this first day of spring was draped in a blanket of snow. With daily temperatures swinging from below freezing to 45°F, this last week of winter has been brutal. It’s not been very inspiring for getting out and about, but more inspiring for cold-weather comfort food. 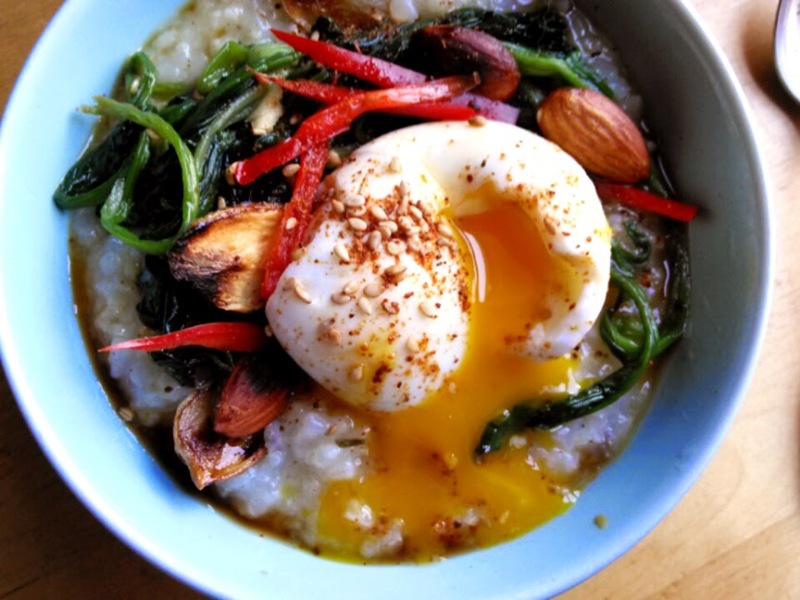 For breakfast, lunch or dinner savory Korean rice porridge is one of my favorite winter meals; juk is simmered with Asian rice and chicken stock. It’s flavored with ginger and garlic but mot overly spiced. Usually it’s accompanied by many flavorful side dishes, both savory and sweet, and sprinkled with toasted sesame seeds. 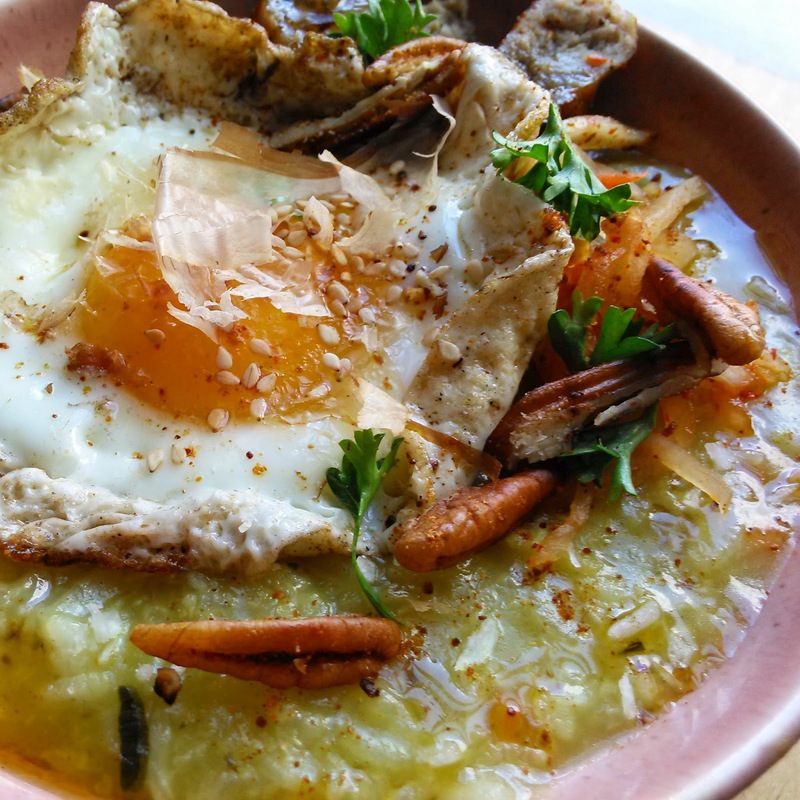 Juk is a simple dish that begs for exploration. I have an easy recipe on my blog; if you want to give it a go click here. 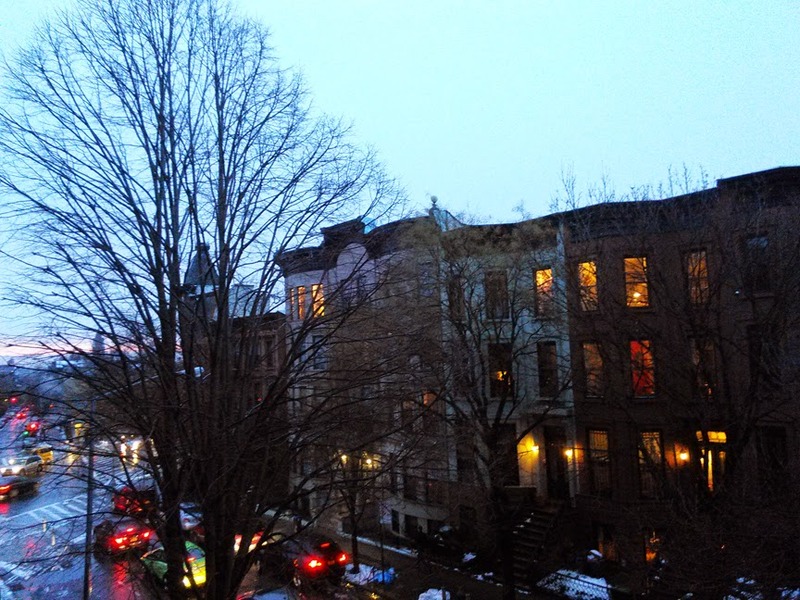 Take a look at some home-cooked highlights from last week. I hope these photos inspire you... or at least make you drool. 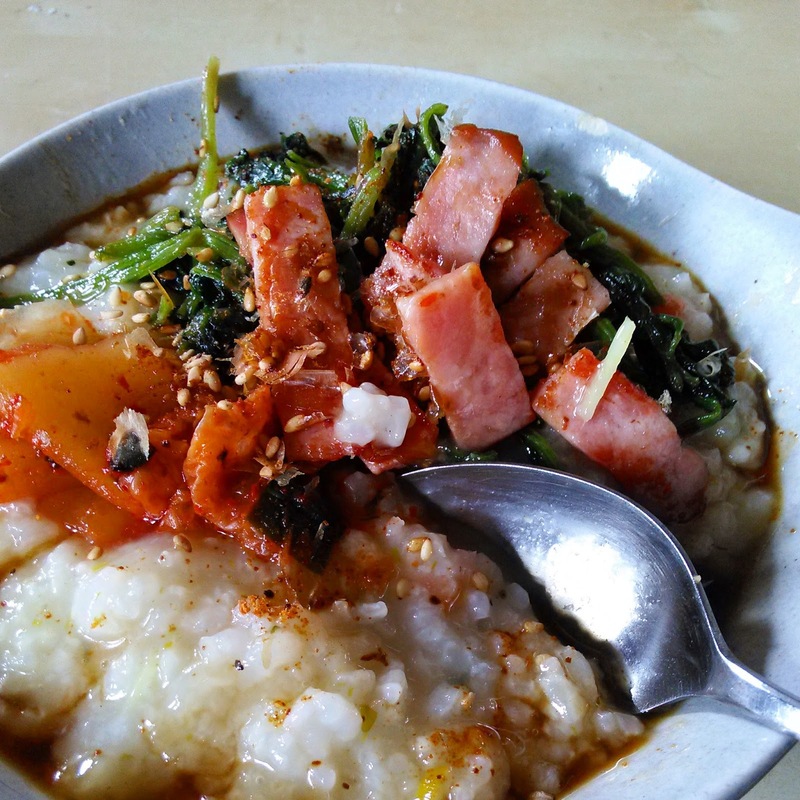 Now here’s some classic Seoul food: dak juk, a savory Korean rice and chicken porridge. 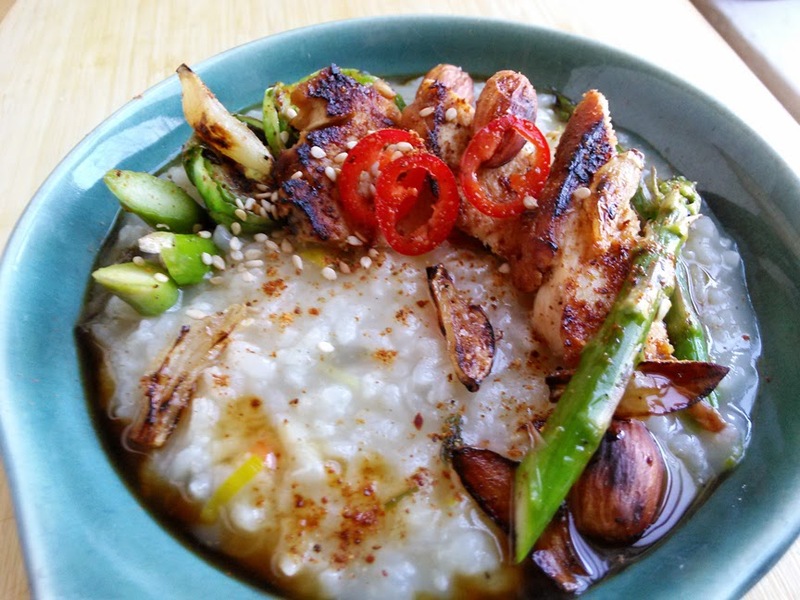 This dish is traditionally made by slowly simmering Asian medium grain rice and a whole chicken for hours until it creates a thick and silky porridge. It’s lightly seasoned with ginger and ginger and served with full-flavored banchan (side dishes) that typically accompany Korean meals. Although it’s a savory dish its best served with a little sweet for balance with chopped dates or a little honey. 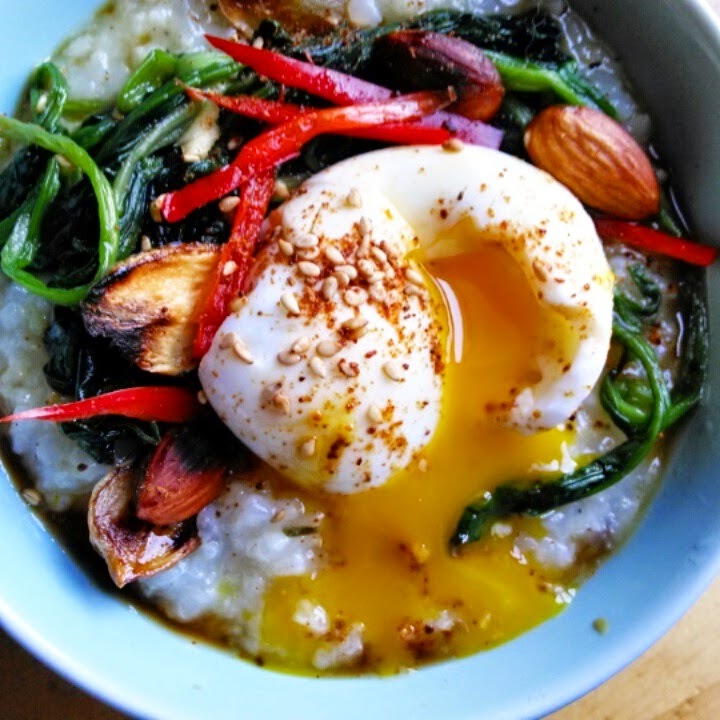 From waste-not-want-not cultures come some of the best comfort food; juk (Korean), congee (Chinese), jok (Thai), lugaw (Filipino), deythuk (Tibetan) and okayu (Japanese) are similarly the same porridge but vary by cooking liquid and what accompanies the meal. This includes arroz caldo, the Portuguese rice soup which finds it’s origins in Macao. Chop chop! 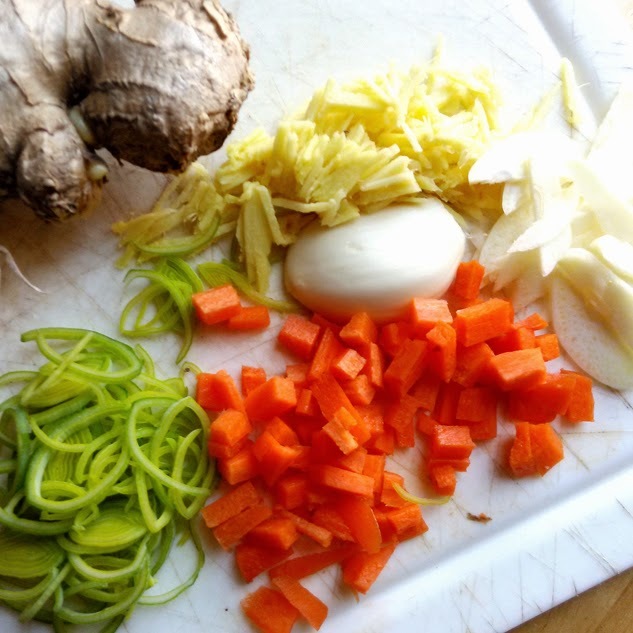 Get your aromatics ready. 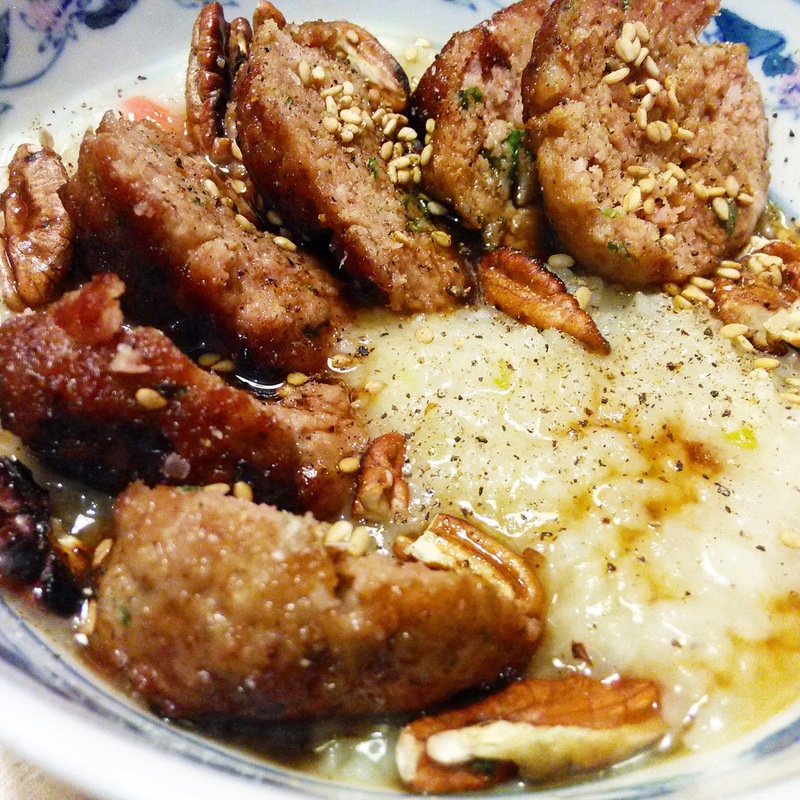 In this recipe I’ve made some shortcuts; I call it mak juk (Korean for easy porridge). The key to this dish is using a good chicken stock. Each month I break out the large stock pot and make my own thick, silky chicken stock by simmering bones, meat and vegetable scarps that I save in a freezer bag. But in a pinch I also make a decent “stock hack” by reducing a carton of organic chicken stock with a small onion, a little salt and unflavored gelatin (or chicken feet if I can find them instead of gelatin). Note: Use organic stock, not broth. Although this recipe is gluten-free by nature, people with celiac disease should always check the ingredient list for GF claims; that’s one incentive to make your own chicken stock when you can. I prefer Asian medium-grain rice over long grain rice; it incorporates well into porridge and holds its shape and texture much better than a long-grain rice such as Basmati— a short grain rice might be too sticky. In a pinch, Jasmine rice from Chinese take-out seems to be a happy medium. As my grandmother used to say “Don’t throw out that leftover rice!” So let’s get busy in the kitchen! This recipes serves six hungry people— cooking and prep time is about one hour. Pour a carton of chicken stock into stock pot and bring to a boil, add quartered onion, salt, sugar and pepper corns. Lower heat and simmer until stock is reduced by one quarter of volume. Strain stock through a fine sieve, discard solids and dissolve a packet of unflavored gelatin into the reduced stock; stir well and reserve 1 3/4 to 2 cups. Prepare garlic and ginger, sprinkle with a pinch of salt and set aside. Bring 5 cups of water to boil, add reduced stock, lower heat. Add rice, garlic, ginger, peanut oil (or sesame oil), diced carrots, salt an black pepper. Cover and simmer on low for about 45 minutes, stirring occasionally. When the porridge thickens, remove from heat and allow to cool, adjust salt if needed, but it should be mild and savory. Serving in bowls with your favorite toppings, drizzled with soy sauce and sprinkled with toasted sesame seeds. You can make Juk ahead of time, it will store well refrigerated for about three days. Reheat it in a double boiler or microwave. 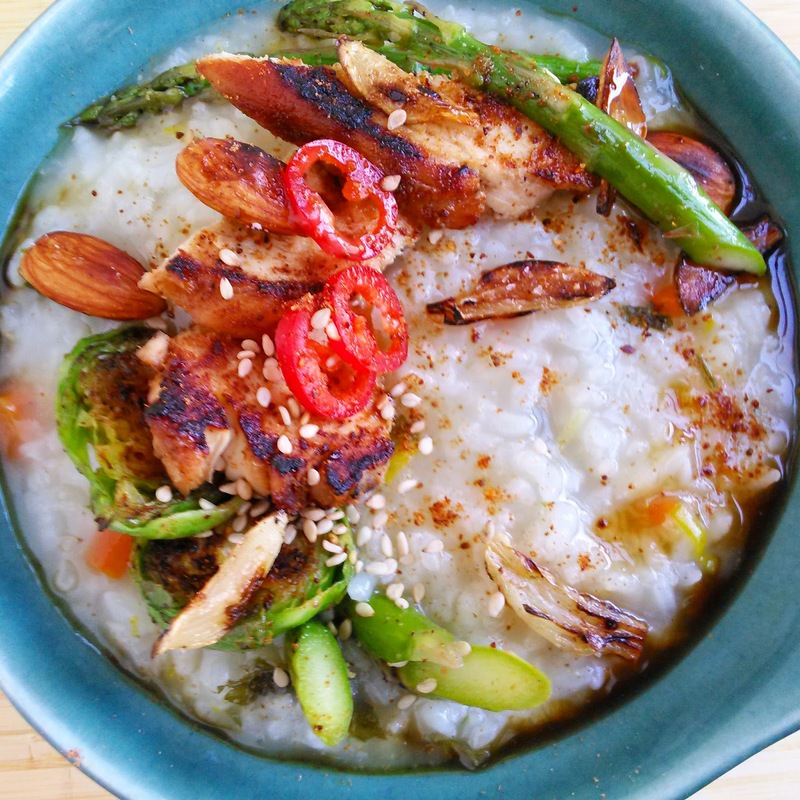 Yesterday’s miso-honey roasted chicken breast is today’s Korean porridge topping— waste not a thing. The Gluten-free EatUP celebrates its one-year anniversary! This pop-up market is dedicated to the food makers that serve people with celiac disease or who live with a diet that is free of gluten; GFEU is sponsored by Levine’s General Store. Mac ‘n’ cheese, grilled kimc-cheese sandwiches, vegan empanadas (Yum Pies)... hot-served and packaged savories, sweets, vegan kimchee and so much more. Glutenberg beer is available at the bar. Admision if free! 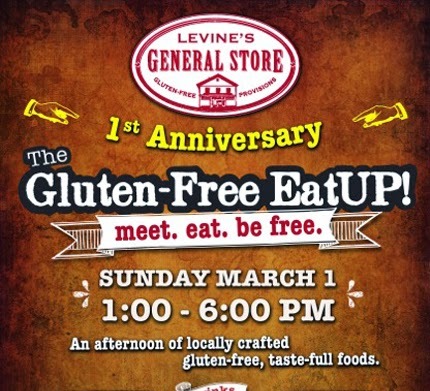 Levine}s General Store will be raffling fabulous gift boxes! Bring your friends. 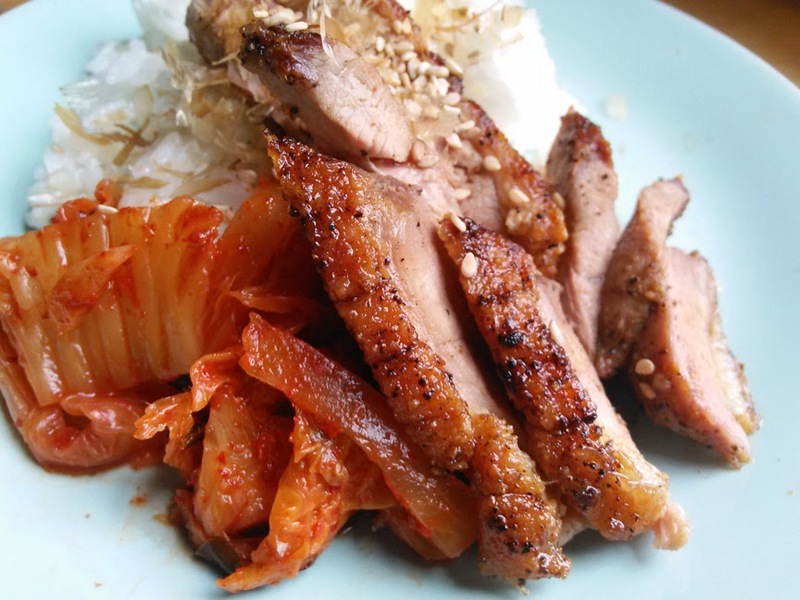 Pan-seared duck breast rubbed with sea salt, black pepper and Hanguk Saffron— thinly sliced and served with kimchee! There’s dak (duck) bulgogi, then there’s ori (duck) bulgogi. To avoid any culinary confusion... I made DUCK bulgogi. Pan-searing a duck breast filet is not hard to do at all, but there are some general guidelines to follow. Duck is poultry, just as chicken and turkey are, but the flesh is more comparable to a red meat animal. It’s cooked as beef or pork would be. Unlike red meat, duck is lower in saturated fats. Most of the ducks fat is in the skin, were as it’s marbled throughout a good cut of red meat. A younger duck will be more tender and flavorful than an older one. 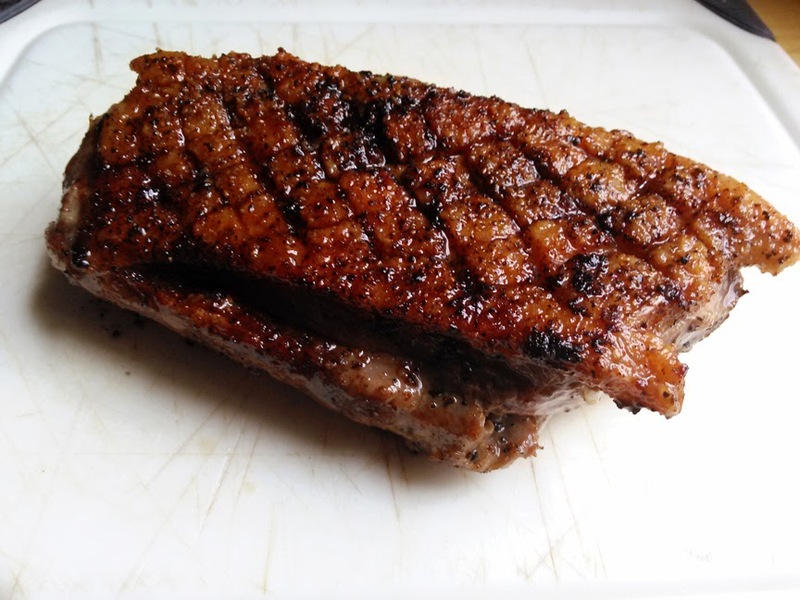 Since duck is very fatty the first objective to making a moist, crisp breast is to render most of the fat and moisture from the skin before completely cooking it. Instead of marinating the best way to flavor this dish is to dry-rub with seasoning; I use my Hanguk Saffron, a powdered seasoning made from dehydrated kimchee (inset); in this recipe we’ll estimate the flavor with mixture of dry spices. If you have frozen duck breasts, let them thaw in the fridge for two or three days ahead of cooking. Never let it thaw out on the counter, it will toughen the meat. Wash duck breast and pat dry. One way to remove moisture (after washing) is to let it sit skin-side-up in the refrigerator for two to three hours before cooking. Estimated cooking time for this recipe is about 18-20 minutes. Dry-rub mix and cooking low and slow is the way to go for this dish. 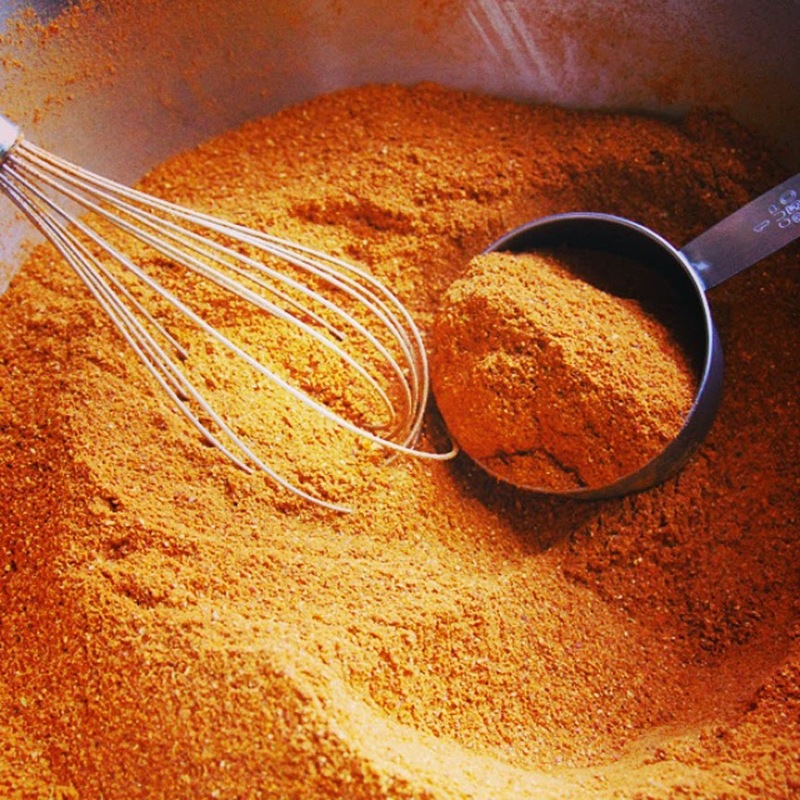 Mix dry-rub spices in a small bowl, set aside. With a sharp knife, score the skin-side of both duck breasts making shallow diamond cuts; avoid cutting into the flesh. Salt liberally on both sides, then sprinkle with pepper. Sprinkle half the amount of the dry-rub mix on the meat side of both breasts. 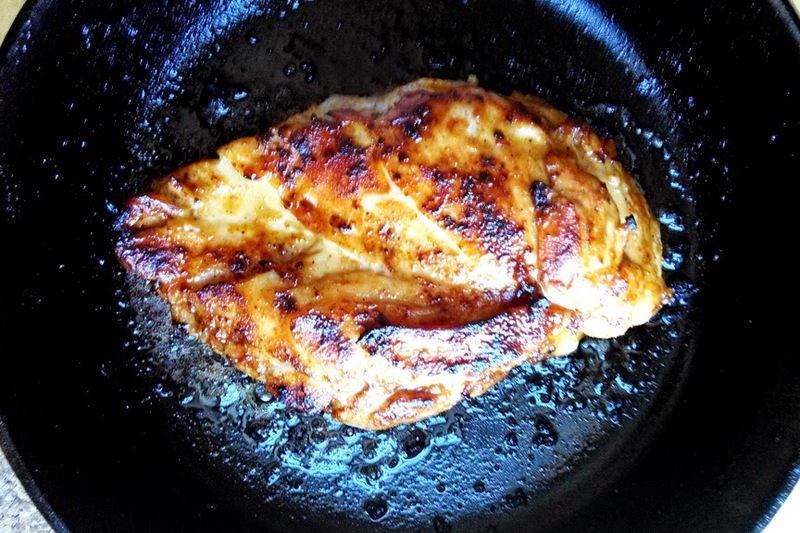 Heat a large cast iron skillet on a low flame and place the breasts in skin-side down. Allow to sear low-and-slow for four minutes, then lift to check that the skin is evenly crisping-up. Continue to sear for another 5 minutes and reposition in the pan to ensure that the skin evenly browns. You can use a spatter screen if it gets messy but do not cover with a lid. The objective is to slowly remove the fat and moisture from the skin my searing on low heat. Starting with a medium or high flame would seal the fat in the skin, making the meat greasy. This process will release a good amount of fat, drain from the pan as needed. Duck fat is a good fat which is high in monounsaturated and polyunsaturated fats. You can freeze and save the fat for making confit or refine it to use as a cooking fat instead of lard. Flip breasts over and sear the meat side for about 8 minutes or until the internal temperature reaches about 122°F, the flesh feels as firm as the tip of your nose when you press on it. Raise flame to medium heat, flip over skin-side down and sear for two more minutes. Is it done? Check by lancing the center of the best, if liquid runs clear, remove from heat and let it rest for 6 minutes before serving. The skin should be crisp and the meat should be firm but not over-cooked. To serve, cut diagonally against the grain of the meat and glaze each slice with sweet soy sauce and sprinkle with toasted sesame seeds before plating. And there you have it, a Korean spiced duck breast, pan-seared to perfection. The garlic confit pesto is vegan— made with parlsey and ground almonds. Obviously the chicken paillard is not vegan. Pesto is mostly known as the verdant, flavorful Genoese paste made with basil, garlic, grated Parmigiano Reggiano cheese and olive oil. There are many version throughout Italy that vary by region. Not all Italian pesto is green. Two of my favorite reds that (eponymous to their region) are Pesto alla Calabrese made with grilled red peppers, ricotta cheese and ground black pepper, and Pesto Rosso (alla) Siciliana made with sun-dried tomatoes and ground almonds. Both are served over bruschetta a the Italian table. But there are variations of this condiment paste made world-wide: Argentinian Chimichurri made with cilantro and oregano; Chinese black bean sauce made with fermented black bean and red chili; Thai peanut sauce made with ground peanuts, sesame oil and fragrant spices. This vegan pesto recipe is made with garlic confit— garlic which is slowly poached in extra virgin olive oil until golden. It has a creamy soft texture and a slightly sweet flavor that is reminiscent of pine nuts, without the sharp, sulfurous overtone that is typical of crushed garlic. Click here for the recipe on my blog. Instead of basil and pine nuts this recipe calls for parsley, ground almonds and toasted sesame seeds. Since this is a vegan recipe I use nutritional yeast. 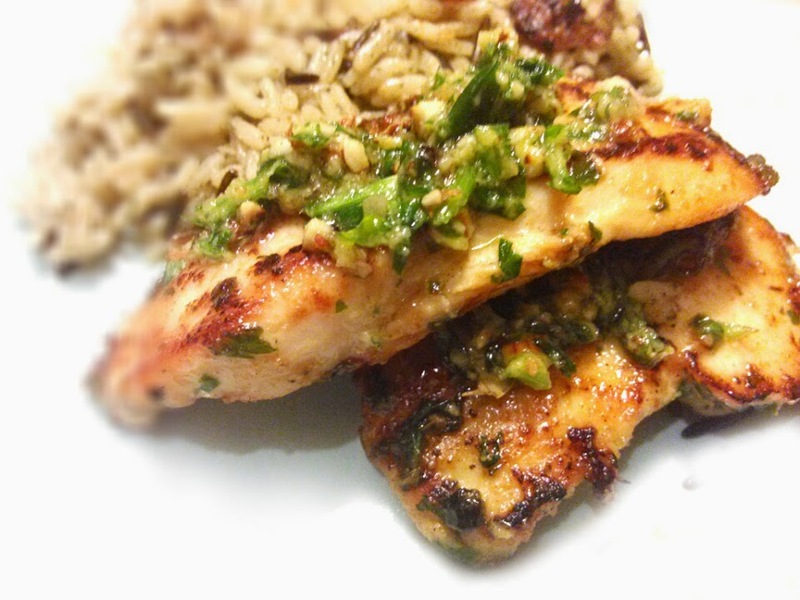 You’'ll need a food processor for this recipe. Toast your raw almond and sesame seeds ahead of time and set them aside to cool. Wash parsley and air dry or run through a salad spinner. Use good quality extra virgin olive oil (aka EVOO for the food smarties), it makes all the difference. This pesto will keep refrigerated in an air-tight container for about three days. It’s best to make small batches, but if you make more you can freeze this pesto for future meals. In a non-stick pan, set flame on medium-low and toast raw almonds until they have release some of their oil; try not to scorch them, set aside to cool. Toast sesame seeds until the start to pop, set aside to cool. Roughly chop parsley to break up large stems. Pulse almonds and sesame seeds in a food processor until they look like gritty sand. Now add all the remaining ingredients and blend until you have a smooth paste. Scrape down the sides of the food processor with a soft spatula as needed. Transfer to a small bowl and serve immediately. You can serve it in a pasta dish or use as bruschetta. 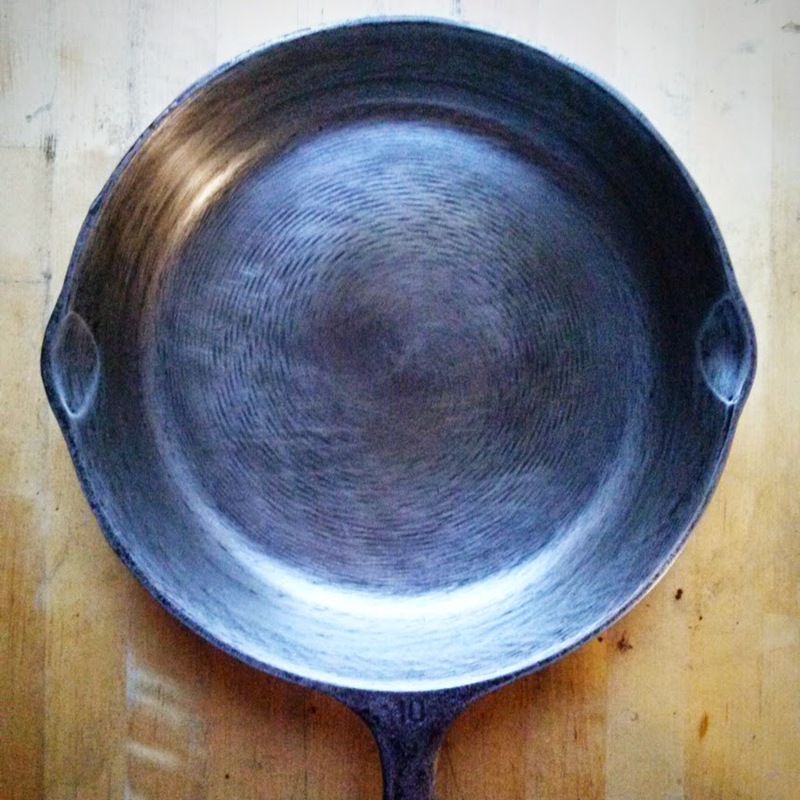 Use a cast iron pan as a heat diffuser. 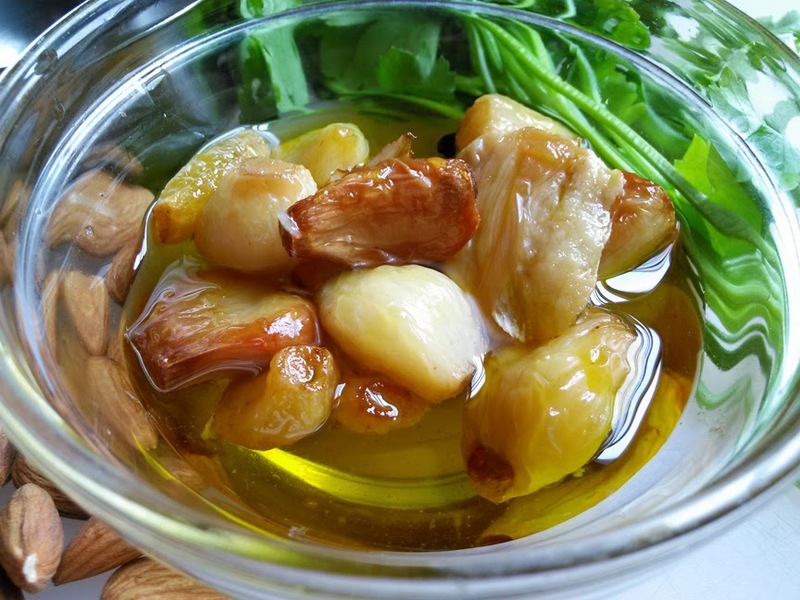 Savory, earthy with mild, sweet notes of pine nut— that’s the best way I can describe the complex flavor of garlic confit. The texture of each plump, golden clove is soft enough to spread. Confit (from the French) is a method preserving food by poaching it in oil (or fat) at temperature lower than frying (about 200°F), after which it is stored at a refrigerated temperature. This low-slow cooking renders out allicin, the sulfurous enzyme that gives garlic its pungent aroma and flavor— leaving the sweeter flavor compounds. I’m sure it’s as healthy as all-get-out, but I just love the way it tastes; it deepens the flavor of savory foods. I first had this wonderful side dish a few years back when my friend Heather McCabe threw a mid-winter party. She baked fresh garlic cloves in extra-virgin olive oil in a covered cast iron dish. I’ve since adapted this recipe for the gas range. The key to this recipe is using fresh plump garlic cloves, good quality olive oil and most importantly low, constant heat. Even if you use a thick-bottom pot you’ll need to use a heat diffuser— or try this kitchen hack: use a cast iron pan instead. I found it delivers a even low heat over an open flame; an added bonus it that it also acts as a heat conductor for an induction burner. I cut elephant garlic in half to get an equal size with regular silver skin garlic. The cloves are poached in oil, not fried. Peel and wash your garlic cloves ahead of time and make sure they are dry before cooking. Select large plump, unblemished cloves of garlic of similar size— even sizes ensure even cooking. If you’re using a cast iron pan instead of a heat diffuser, pre-heat it on medium flame then lower flame for cooking. TIP: Here’s a quick way to peel whole garlic without making a mess: trim off the hard base on each clove, place three or four cloves into a tall jar, cover and shake vigorously. The skins will have fallen off or come loose enough to peel easily. Discard the the skins or save them to make stock. Place garlic cloves, bay leaf and pepper corns in small pot and add olive oil. With a heat diffuser (or cast iron pan) placed directly over the flame heat pot on medium heat until the oil just starts to bubble (one minute) then adjust flame to very low heat. This first step is important; the cloves should poach in oil, not fry. If oil starts to boil, remove pot from heat and cool down, then return to burner. Cover and cook low and slow for about 35 to 40 minutes or until they are golden in color and fork-tender (larger batches may take up to an hour). Check to make sure that the oil does not boil and the garlic cloves are not burning. Add roasted sesame oil and remove from flame; set the pot aside uncovered and allow it to cool. With a clean spoon carefully transfer garlic to a clean jar, then add the oil and other ingredients from the pot to the jar. Seal tightly and store in the refrigerated. You can eat it once it has cooled but I found it develops a more complex flavor and better texture after 24 hours. 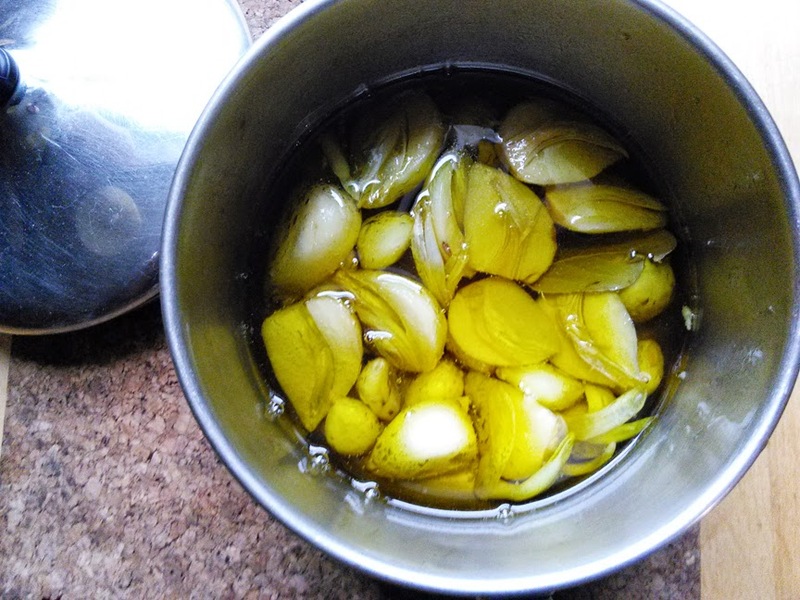 Garlic confit will keep for about 6 to 8 weeks in your refrigerator. Mix it with mayonnaise and use it as a sandwich spread or serve as a side dish at the table. 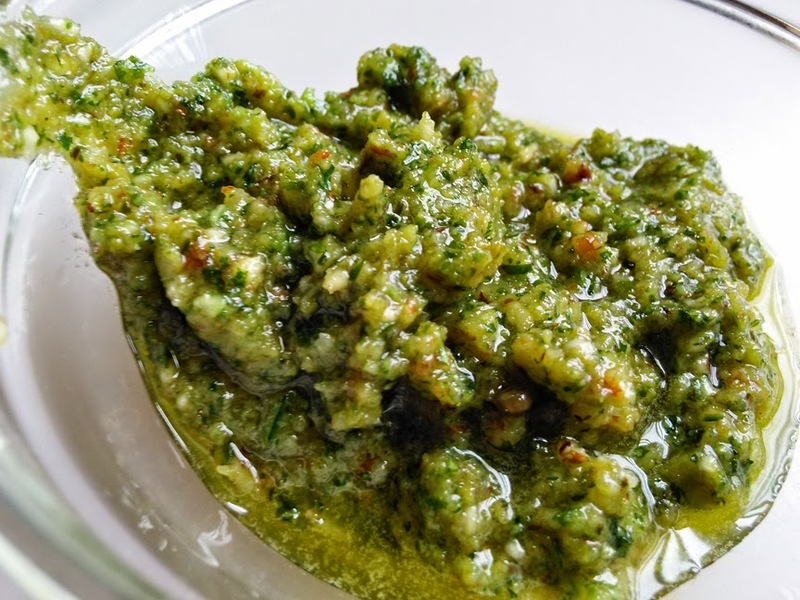 On one favorite thing to make with garlic confit is pesto with parsley, ground almonds and a little salt; simply delicious Do not reuse the infused oil for making more confit, use is it to flavor other dishes instead. 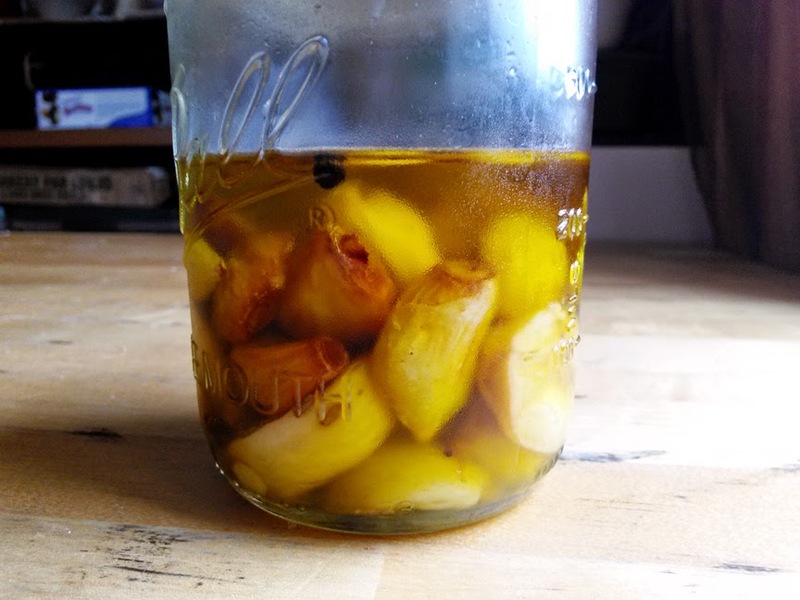 Precious amber and gold— garlic confit will keep for 6 to 8 weeks in the refrigerator. You won’t find these at an artisanal food truck. I re-shot some photos for the ePUB cookbook. These Mexican-Korean fusion meals get better each time. Dak bulgogi fajitas (Korean BBQ chicken) on hand-rolled corn tortillas and little huaraches de niñas are delicate yet substantial, filled with chicken and kkadugi (fermented Korean radish) ceviche. I used fresh red Korean peppers instead of jalapeños and passed over the cilantro for julliened leek salad and bib lettuce for a more Asian flavor. 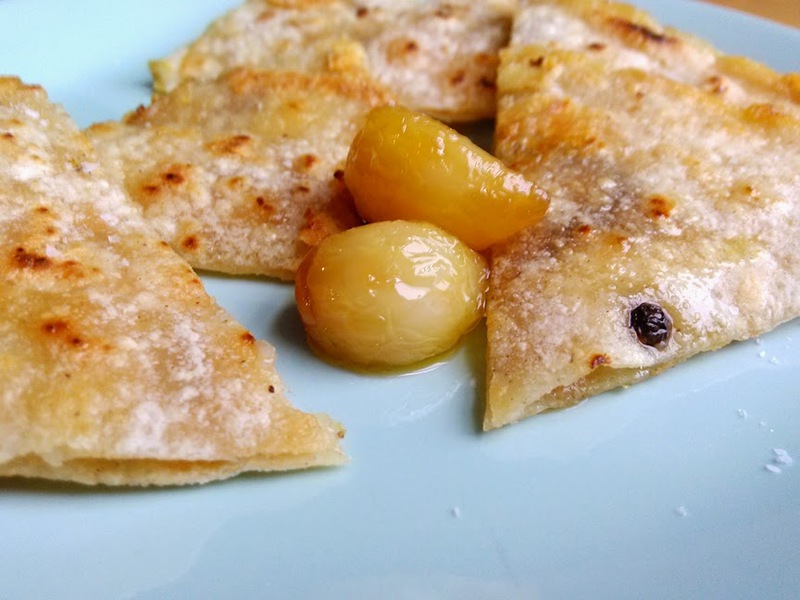 Of course you have to use good queso de cotija if you can find it. 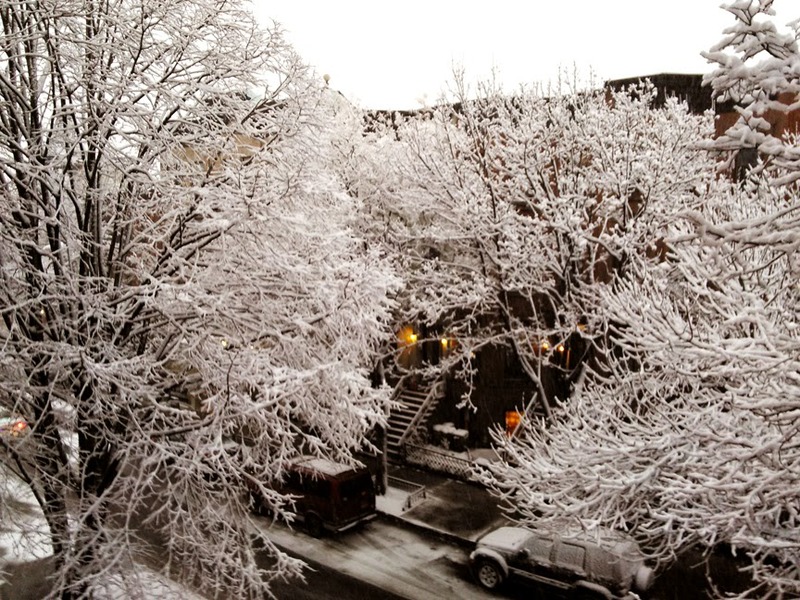 Winter storm Juno came and went with not much to write home about; I took some pretty pictures in my neighborhood before, during and after. 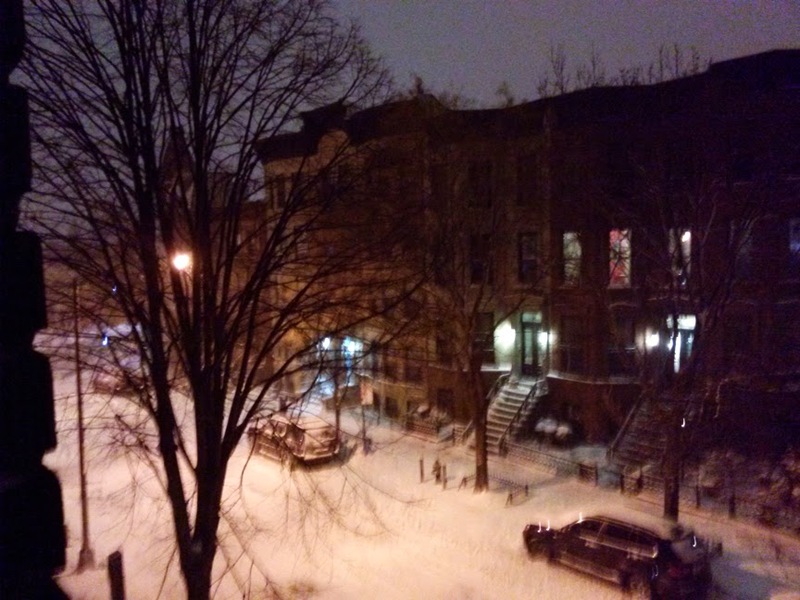 What a way to start 2015, huh? 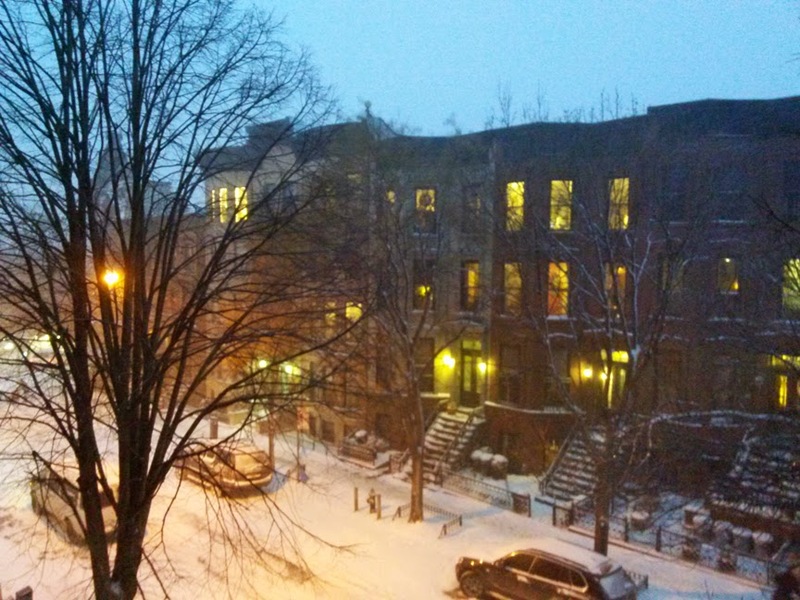 The worst damage was the thick salty slush that followed and a messed up work week for NYC. 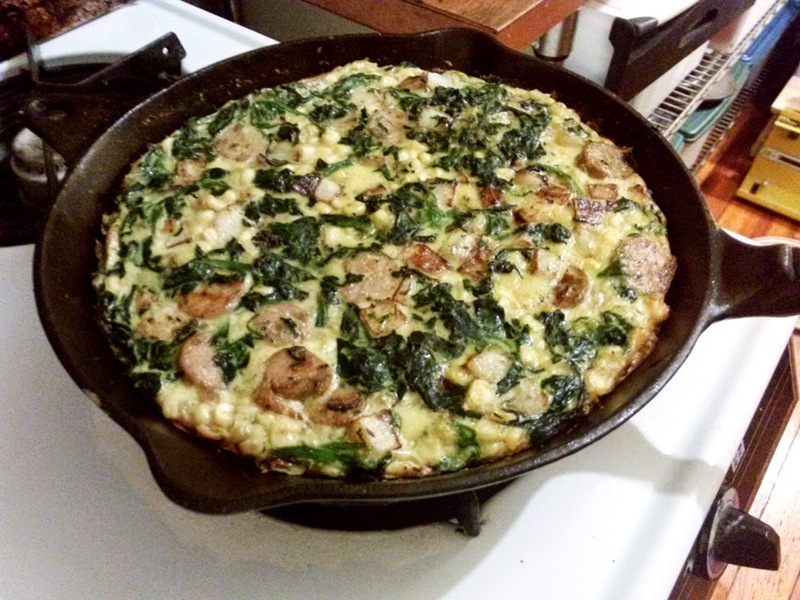 Of course it inspired some pretty tasty cooking, I made a corn, potato and spinach frittata and we played the cats til they were sick of us.